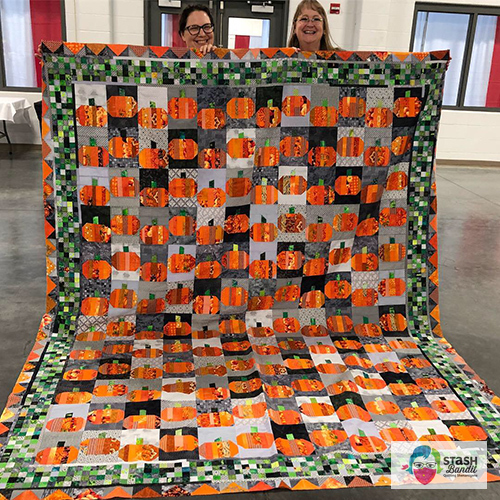 Bonnie Hunter of Quiltville fame visited three guilds in Nebraska last week, and it was such fun to reconnect with her. Bonnie has had a long-term working relationship with Quiltmaker, where I worked for 11 years, and that’s how we first met. I hadn’t seen her since we both taught at a Quiltmaker event about 10 years ago. She’s as warm and outgoing and funny as ever. 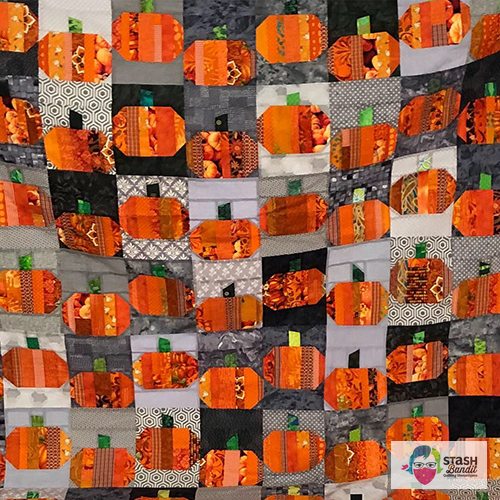 Bonnie’s quilts always look great in photos, but when you see them in person they’re even better. Such energy! 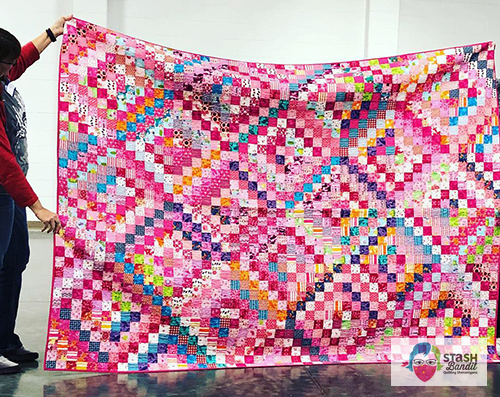 This is the original Wild and Goosey that took the quilting internet by storm, and it’s a gobsmacker. You have to see it to believe it. Here’s a closer look, though it’s a bit out of focus. 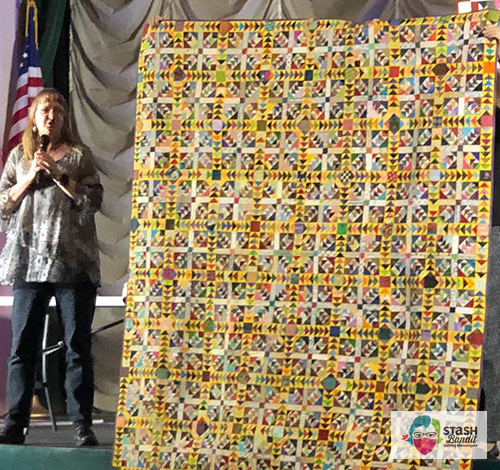 It’s hard to listen to an entertaining speaker, enjoy the quilts and take good photos all at once! 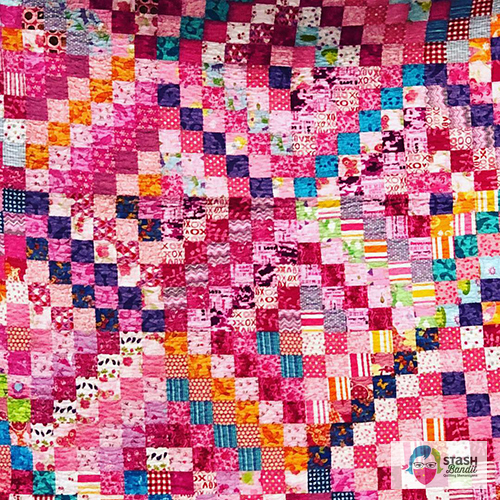 For me, the intrigue of this piece lies in the small size of the patchwork and the sheer volume, not to mention the variety of fabrics. And that yellow is fabulous. This is another quilt that knocks your socks off in person. It looks good in the book, and it looks good here, but when you see it live it just sparkles. Bonnie takes string piecing to another level. What used to be homey, make-do and common is highly elevated when the Grande Dame of Quiltville takes it on. These photos were taken during Bonnie’s lecture in Grand Island, Nebraska. 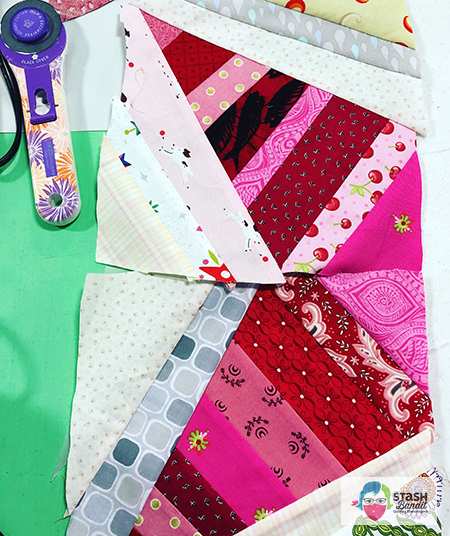 The next day, I took a class where we made string pieced blocks for a quilt called Virginia Bound from Scraps & Shirttails by Bonnie. The start of my first block. Not many pictures of the process because I was so busy listening, looking at other people’s fabrics and zoning in on the tips being shared. A very pink (love it!) Scrappy Trip Around the World. (click for a free tutorial from Bonnie!) What girl wouldn’t love this? Here’s a closer look. So wonderfully scrappy. On the back, the maker used Scrappy Trip blocks with smaller patches. She’d started the quilt with these smaller patches, but soon realized they were a little too small for her purposes and switched gears. Wasn’t using them on the back a marvelous idea? 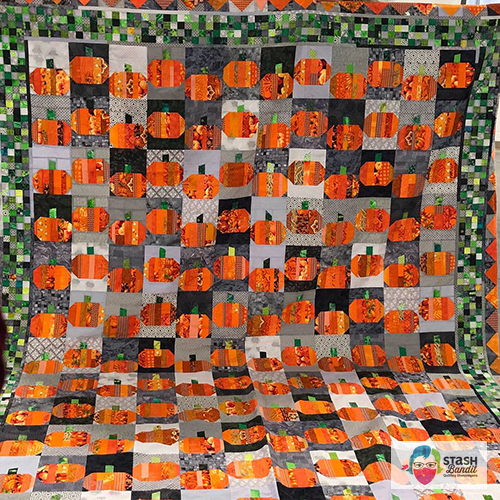 Another workshop gal brought her finished Punkin Patch quilt, a Bonnie Hunter design from Quiltmaker. Aren’t those scrappy oranges, grays and greens spectacular? Look more closely. And really zoomed in, below. 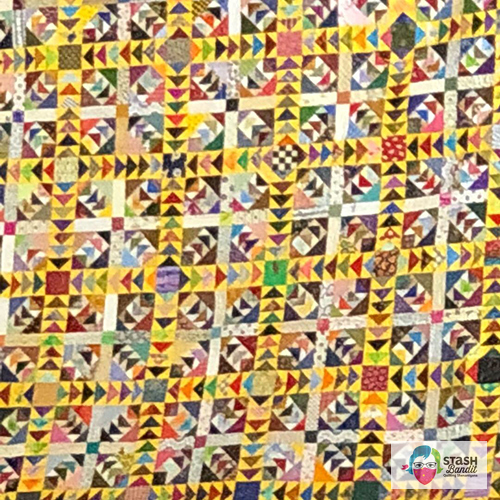 There were many wonderful quilts shared, the inspiration just wouldn’t quit. All in all, it was great fun. More quilts from Show & Tell with Bonnie in the next post. See you then, and in the meantime, happy quilting! 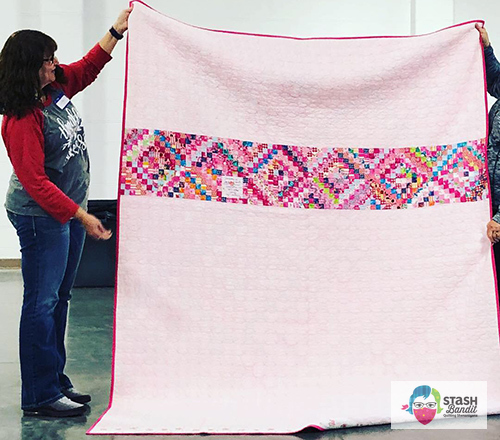 If you’re not familiar with Bonnie, visit Quiltville today. Plan to stay a while! I got to see Bonnie and her quilts at the Cottonwood quilt guild on Tuesday. 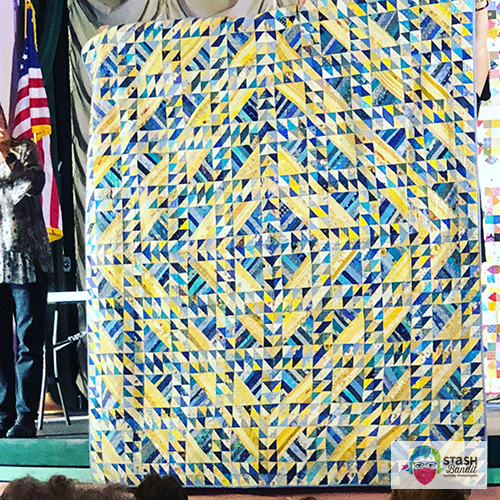 You are so right about seeing her fabulous quilts in person……and hearing her speak is just amazing. I have made ALOT of her quilts, and am so glad I got to see her. Diane-I also saw you speak at Cottonwood a few years ago. Your quilts are also VERY special. Hi Jean, thank you for your kind words! That means a lot to me. 🙂 So happy to hear you enjoyed Bonnie, too. She is legendary! OH my goodness… how fun is that?!?! Glad to see you having a blast with Bonnie and the scraps!